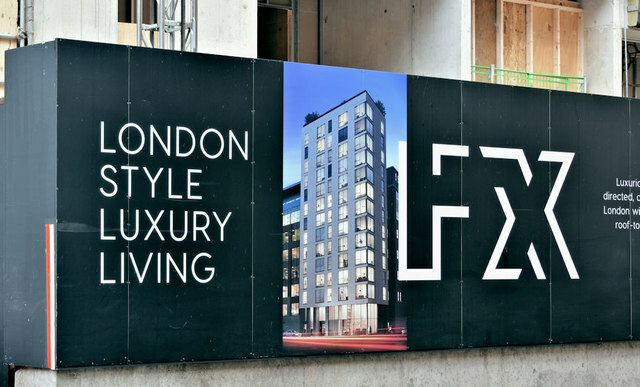 A hoarding, on the Montgomery Street side, advertising “London style luxury living” . . . . . without the overcrowded trains, expensive fares and high council tax. The scheme was approved as follows: “Amendment to previously approved development Z/2010/0641/F. Alteration to apartment layout, reduction from 48 no. 1 person studios to 36 no. 1 bedroom apartments with associated minor elevational changes and replacement of ground floor retail with coffee shop. To include demolition of existing building. PERMISSION HAS BEEN GRANTED 28/09/2012”.